So here it is, my first review for the Schoolhouse Review Crew! You can find them at www.SchoolhouseReviewCrew.com. This is a sample run but I am so excited to be considered. I received a publication from The Old Schoolhouse Magazine for no charge for my honest review of the product. 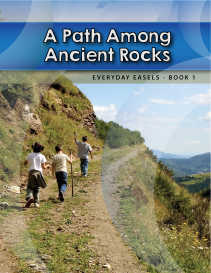 I chose A Path Among Ancient Rocks: Everyday Easels Book 1. It is a 5 to 10-day unit study using art to cover the subjects of art, bible, history, geography, english, math, science, physical education and health, home economics, and archaeology. Whew, that's a mouthful! How awesome is that, to have fun learning about art while covering those subjects! It was a perfect fit for my 12 year old, 7th grade son who tends to thrive on curriculum like this. You can find similar studies like this one and many other homeschool curriculum, supplements and "all things homeschool" at their online shop at http://www.theoldschoolhouse.com/shop/. The first study in the book was a 10-day unit study titled A Path Among Ancient Rocks about a painting by Theodore Rousseau. There was a direct link to the artwork in the pdf file I downloaded. You cover 8 different subjects (art, bible, history and geography, english, math, science, physical education and health, and home economics) on days 1 through 8 and then have a notebooking activity on day 9 and an age appropriate art activity for day 10. I love how the art activities are broken down by age. The three age categories include Grades K-2, Grades 3-6 and Grades 7-12. I felt that the questions in each subject were interesting and challenging enough for my 7th grader. He really enjoys this type of study. The work is not too intense and it allows enough variety and the ability to customize it for your needs. The second study was about Acropolis of Ancient Greece. It is a 5-day unit study teaching about the Acropolis while covering the subjects of art, archaeology/science, geography, history, and then an age appropriate art activity on day 5. The art activities really engage the student to dig deeper into the subject. The type of activity depends on the age group of the student. Sometimes it has more of an art element to it and sometimes it is more investigative and creative for the students to answer and complete certain tasks. The third and final study in this book was about the Designs of Louis Comfort Tiffany. It covers the subjects of art, science, english, history, and another age appropriate art activity. The art activity included an experiment that was very enjoyable. I really like the links included in each of these studies. It allows the student to explore other art works and dig deeper into the subject matter. This entire book is a wonderful Charlotte Mason type resource and the diversity of the book kept the subject matter very interesting. My son was able to complete the lesson without too much trouble (he really doesn't like to write) and it kept his interest in the subject matter. We learned a lot together as we explored the included links in each of the studies. I would definitely recommend this book, especially if you like Charlotte Mason curriculum. The amount of information learned in the studies is wonderful. The active links in the pdf file really help to engage the student and allow for much deeper learning of the subjects. I will end this review with a wish of Happy Thanksgiving! May your day be blessed and please feel free to comment or ask any questions. It was a joy to be considered for this opportunity.